The summer has ended well here in Santa Monica, California. The Beach Ball Festival 2013, presented by KCRW, sparked up an Irie Sunday session with legendary reggae artists and bands. Living on the brighter side is what reggae music does; putting you in the mood to live it up and praise the most high for the life given. Coastal reggae events are always a pleasure, giving you the raw island vibe of true Jamaican music. Imagine a setting of flowing tides, sun on the rise, and live reggae riddims being played. This was how the beginning of a great night started. Tom Chasteen (DJ/producer), representing Dub Club, spun his treasured records keeping the crowd-entertained when needed. Hosting the show was Ghanaian Afro Roots singer/songwriter Rocky Dawuni. He made sure to share achievements and known facts on each artist and band creating more clarity and appreciation toward each performer welcomed on stage. Soul Syndicate was the first performing act. The 70s is when their journey began. George "Fully" Fullwood the bassist as well as the founder of this group couldn’t have chosen his members any better with Albert Valentine "Tony" Chin playing rhythm guitar and Carlton "Santa" Davis on the drums, their chemistry is powerful. The three stand strong together anytime they share the stage. Donovan Carless was on lead vocals. Donovan has been recording since the early 70s and still going strong as a performing act. It’s amazing to see these artist that have laid a foundation for the reggae scene still performing and sharing their life stories through music. 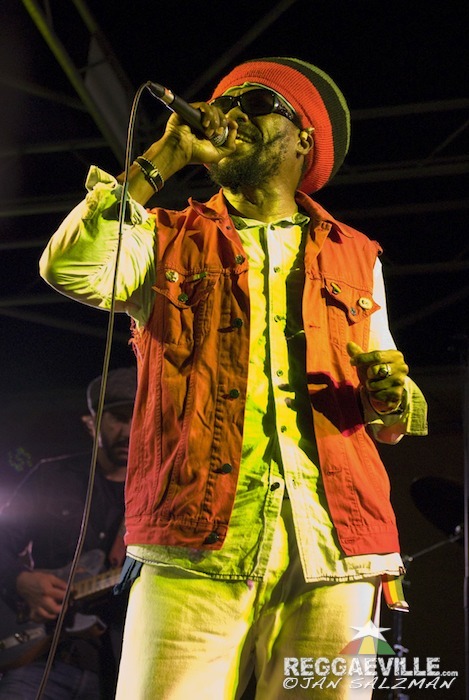 Soul Syndicate performed many songs that have gone internationally such as Harvest Down Town, Black Cinderella, and Red Gold and Green, which can be heard on their 1977 LP album Harvest Uptown / Famine Downtown. Soul Syndicate's reggae session has not ended. As they finished up their performance the next set will be with Daddy U Roy yet another legendary Jamaican artist that is one of the first pioneers on toasting. It’s the tone of his voice that brings a distinct melody. Some of the great songs U Roy performed were Wake The Town, Wear you to the Ball, Queen Majesty, and Soul Rebel an original by Bob Marley. Also on stage was Richie Kanary a vocalist, which really complemented U Roy's style of toasting. What we all are seeing here are Jamaican artist living their dreams. Music and traveling is what calls in their path as they let us experience their most remembered moments through each performance. Daddy U Roy did an amazing set and it was nice to hear him big up all the band members that helped him sound so fresh. One by one he let them give their best for a few seconds just to show the crowd their solo sound, but at the end they all combined their talent. U Roy was smiling big to each of his fellow band members and most importantly to his fans. Catching the sweet vibes is not over yet as U Roy and Soul Syndicate walk off stage. The next performing act began to set up. 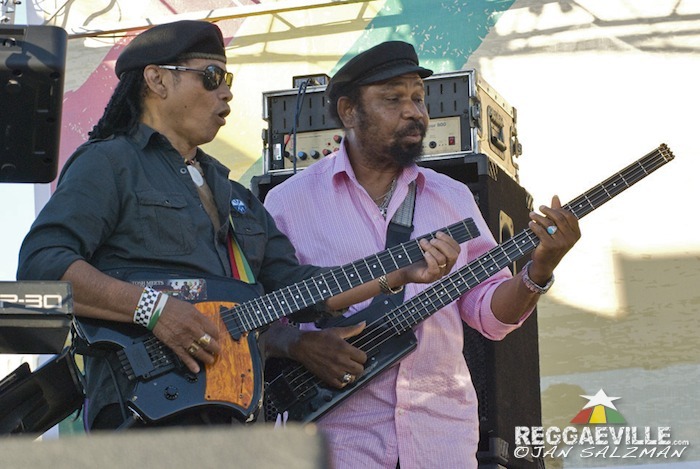 More of reggae history is about to move the crowd with their monumental music that has been heard for over sixty years. 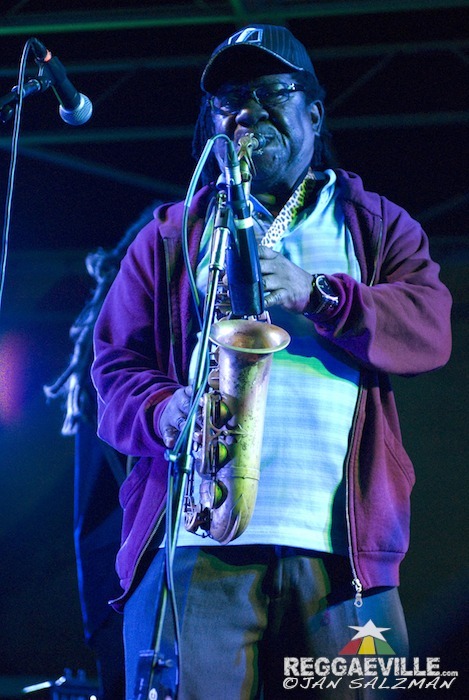 The Skatalites is an orchestra that has made reggae music what it is today. They’ve created the sound of ska, infusing the beats of rocksteady and complementing it with the essence of jazz . This band has had many members come and go, but now with only two living original members performing it’s an honor and a privilege to see them live. Imagine how the others felt sharing the stage with such individuals that have help paved their way as successful musicians. Lester “Ska” Sterling on the saxophone and Doreen Schaefer vocalist are the elders we must respect and more importantly love. Love the passion they have for their music and how they still are standing with pride and affection for their fans. Sterling is a remarkable saxophone player and also is a writer and arranger of their music. He still got it in him to play music, which he began learning in the early 40’s. Doreen Schaefer has an extraordinary voice that has a soulful melody everyone is all ears for. The Skatalites has the people moving in a rhythmic wave that this well-known orchestra created long ago. Songs they chose for this special night included Latin Goes Ska, Cant You See, and Sugar Sugar. One thriving classic was Bob Marley’s Simmer Down a song they performed and help get international exposure with Bob in the early sixties. Now it was time to enhance the night with the last performing act. Giving a great applaud, fans were very thrilled to see Lowell "Sly" Fillmore Dunbar and Robbie Shakespeare on stage with Michael Rose. Sly doing what he loves most playing drums and Robbie on bass. Michael Rose is backed by some of the greats that have also helped him producing top hits under their label called Taxi Records. He has this blessed smile as he greets the audience with his presence. Songs he performed that really pumped the crowd were What is Life, Sponji Reggae, and Shine Eye Gal. He is a great artist with much energy and talent.The crowd had their hands in the air as he sung his last track Sensimilla. To end the night right Rose brings out his brethren and one of the original members of Black Uhuru: Garth Dennis. Garth hears Michael Rose say his name and it was a call for him to share the stage and sing with him. Sly & Robbie also past members of Black Uhuru had Michael Rose and Garth Dennis on point. Singing with Jah's force of oneness - that is exactly how the day went and the night ended.